Alan Pardew's first Premier League game in charge of Crystal Palace ended in a thrilling victory as they came from behind to beat London rivals Tottenham. A superb low strike from Harry Kane, the striker's 18th goal of the season, gave the visitors the lead. Palace - who missed a great first-half chance through Glenn Murray - levelled through Dwight Gayle's penalty after Benjamin Stambouli felled Joe Ledley. And Jason Puncheon grabbed a late winner with a low left-footed strike. Puncheon's goal added to an already frenzied atmosphere as the sound of renewed optimism, justified as the hosts displayed endeavour and fight under new management, rang around Selhurst Park. 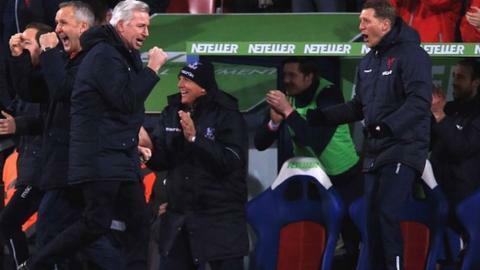 In the build-up to his first game in charge at Selhurst Park, Pardew said having the backing of 99% of the stadium was a "great feeling" and the former Palace player, not accustomed to such admiration from the stands during his four years in charge of Newcastle, punched the air and saluted the crowd as the ground erupted at full-time. For the Crystal Palace faithful, it was their time to also enjoy an unfamiliar feeling, that of victory - their first win in nine league games which lifted them out of the bottom three to 15th. Tottenham, who had the majority of possession, were unable to replicate the form which earned them a spectacular 5-3 victory over Chelsea in their last Premier League outing and the defeat is a setback to Mauricio Pochettino's hopes of a third-place finish. The north Londoners were the more creative and assured of the two teams until Palace levelled to spark a dogged fightback, which ended Spurs' seven-match unbeaten run in all competitions. Christian Eriksen lacked composure, half-volleying wide from six yards in the first half, but fortunately for the visitors, in Kane they have a striker who possesses coolness in abundance in front of goal. The Englishman shuffled for space near the edge of the box and confidently struck into the bottom left corner for his sixth league goal in as many games. Palace, playing on the counter-attack, lacked such ruthlessness, with James McArthur heading over the crossbar from close range and Murray wasting a fine chance when put through by McArthur before the break. But the south Londoners were positive after falling behind, with their best chance falling to Gayle, whose stabbed effort was aimed straight at goalkeeper Hugo Lloris, before the forward made amends from the spot. Referee Anthony Taylor deemed that Stambouli's sliding tackle had caught Ledley and Gayle scored a superb momentum-changing penalty. Buoyed, and with vociferous support on their side, Palace played the latter stages with confidence, and a weaving run by Wilfried Zaha ended with Puncheon's winner. Tottenham had a penalty appeal turned down for a Ledley challenge on Kane, before the full-time whistle sparked jubilant scenes. Tottenham manager Mauricio Pochettino said: "I don't want to speak about the referee. I think it is a very difficult job, but it is true the penalty decision changed the atmosphere. "Maybe after we suffered a little bit, Crystal Palace believed they can come to get the three points. "A lot of long balls came in and I think that in this challenge they wanted it more than us. We are disappointed with the result and we lost a good opportunity to stay with the top four." Match ends, Crystal Palace 2, Tottenham Hotspur 1. Second Half ends, Crystal Palace 2, Tottenham Hotspur 1. Attempt saved. Wilfried Zaha (Crystal Palace) right footed shot from the centre of the box is saved in the centre of the goal. Assisted by Jason Puncheon. Attempt saved. Etienne Capoue (Tottenham Hotspur) right footed shot from outside the box is saved in the centre of the goal. Assisted by Nacer Chadli. Offside, Crystal Palace. Julian Speroni tries a through ball, but Jason Puncheon is caught offside. Adlène Guédioura (Crystal Palace) is shown the yellow card. Federico Fazio (Tottenham Hotspur) is shown the yellow card. Fraizer Campbell (Crystal Palace) is shown the yellow card for a bad foul. Attempt saved. Wilfried Zaha (Crystal Palace) right footed shot from a difficult angle on the left is saved in the bottom left corner. Assisted by Adlène Guédioura. Corner, Tottenham Hotspur. Conceded by Damien Delaney. Attempt blocked. Fraizer Campbell (Crystal Palace) right footed shot from outside the box is blocked. Assisted by Jason Puncheon. Adlène Guédioura (Crystal Palace) wins a free kick on the right wing. Substitution, Crystal Palace. Fraizer Campbell replaces Dwight Gayle. Attempt saved. Harry Kane (Tottenham Hotspur) right footed shot from outside the box is saved in the centre of the goal. Assisted by Mousa Dembélé. Attempt blocked. Jason Puncheon (Crystal Palace) left footed shot from the right side of the box is blocked. Assisted by Damien Delaney. Attempt saved. Jan Vertonghen (Tottenham Hotspur) header from the centre of the box is saved in the centre of the goal. Attempt blocked. Christian Eriksen (Tottenham Hotspur) right footed shot from outside the box is blocked. Assisted by Mousa Dembélé. Goal! Crystal Palace 2, Tottenham Hotspur 1. Jason Puncheon (Crystal Palace) left footed shot from the centre of the box to the bottom right corner. Delay in match Hugo Lloris (Tottenham Hotspur) because of an injury. Attempt blocked. Damien Delaney (Crystal Palace) right footed shot from outside the box is blocked. Attempt blocked. Scott Dann (Crystal Palace) right footed shot from the right side of the box is blocked. Assisted by Joe Ledley with a headed pass. Corner, Crystal Palace. Conceded by Federico Fazio. Dwight Gayle (Crystal Palace) wins a free kick on the left wing. Substitution, Tottenham Hotspur. Roberto Soldado replaces Benjamin Stambouli.